NASHVILLE, Tenn. – Deeming Anaheim Ducks forward Bobby Ryan's kick on the skate boot of Nashville defenseman Jonathon Blum in Friday's Game 2 "reckless and dangerous," NHL Senior Executive Vice President of Hockey Operations Colin Campbell suspended the two-time 30-goal scorer for Games 3 and 4 of the teams' first-round series. Ryan will miss Game 3 on Sunday and Game 4 on Wednesday night. On the team's flight to Nashville on Saturday, Ducks coach Randy Carlyle said he knew that it was a distinct possibility that he could lose Ryan, who plays left wing on the Ducks' top line with Ryan Getzlaf and Corey Perry – arguably the League's best -- for at least a game. Carlyle did not dispute the fairness of the suspension. "A little bit surprised with the number of games, but I don't think from anybody's standpoint that there's much of a defense," Carlyle said after the team's practice at the Centennial Sportsplex. "He committed the act. If that's the price that that action warrants, then the League obviously felt that way and we have to live with their decision." Without specifically naming it, Carlyle referenced the eight-game suspension that Chris Pronger, playing for the Ducks at the time, received in March 2008 for a similar offense against Vancouver's Ryan Kesler in saying that he generally agreed with the philosophy of the ruling. "I think there's probably a bit of a precedent set with people who have committed that act," Carlyle said obliquely. "This being playoffs, there's this mindset that playoffs, well, playoff games are worth two or three regular-season games. "There's some credibility to that because people are fighting for their lives. It's a tough situation and it puts the League in a tough situation and we'll move forward." Carlyle said his options for replacing Ryan, who scored 34 goals and 71 points during the regular season and had a pair of goals in Anaheim's 5-3 victory in Game 2, on the Ducks' top line include moving up Brad Winchester or Matt Beleskey. Both have played in that spot during the regular season. Winchester had 1 goal in 19 games during the regular season and Beleskey had 3 goals in 35 games – a substantial drop-off. As for who will take Ryan's spot in the lineup, one possibility is Jarkko Ruutu, who played in Game 1 but was a healthy scratch on Friday. Ruutu saw 6:27 of ice time in Game 1, didn't have a point and took a misconduct penalty in the final minute of Nashville's 4-1 win. Carlyle also defended his player, noting that this is the 24-year-old Ryan's first suspension in the League. "That's not Bobby Ryan's style," Carlyle said. "It's a first-time offense, if anything. I'm surprised. I didn't even see it until after the game. I was surprised to see what happened after the game and there's not a place in the game for that." Carlyle, who was not present for the hearing, said he did not have a chance to speak to Ryan about the decision. The conference call with the League included Ducks GM Bob Murray, Ryan's agent and a representative from the NHLPA. Ryan said he was surprised at the severity of the decision, saying his intent was not to injure but merely to kick the puck loose from along the wall behind the net. He thought he could get free undefended to the front of the net. Ryan's act – which Campbell also said was "unacceptable" in handing down the ruling – went unpenalized on the ice. "I don't agree with it," Ryan said. "Not much to say. Obviously came down right on top of his foot. Saw it about 10 to 15 times today and watched it before the meeting, but I don't see a two-game suspension. But it is what it is and it's his call. Now I'll be a good teammate and move forward." Ryan said after the conference call that he did not think he would be suspended, saying "still don't see it." He went through what happened on the play. "I had tried four or five times in the pileup there to kick the puck loose and the last time I raised my foot a little higher and just turned my foot at the wrong time and came down right on top of him," Ryan said. "The intent was good, the result was bad is basically the best way to put it." Ryan said he "turned around and said sorry to (Blum) on the ice and he gave me a shot, which I just said … can't even say anything. I just kicked him right in the foot, so … I thought it was a wash."
While some of his players were muted in their reaction– Preds captain Shea Weber repeated the mantra "it is what it is" -- Nashville coach Barry Trotz was critical of the play. "From my standpoint, I saw the incident -- that's one of the cardinal sins in our game that you commit," Trotz said. "There's no place for it in our game and the only intent is to hurt someone, so that's what we're trying to get out of the game. He's one heck of a player. I'd love to have Bobby Ryan on my team, but I think he did wrong on that one and there's no place in the game. You talk to any player, it's dangerous and it's a cardinal sin in the game of hockey." Before he knew what the ruling was, Trotz was asked to assess what it would mean to the series if the Ducks were to lose Ryan to a suspension of a game or more. "Obviously, from their standpoint, he's a good hockey player," he said. "It's no different from us losing a good hockey player on our team, so it just puts a lot more pressure on other people to fill in the hole." Blum, a 21-year-old first-round pick in 2007 from Orange County, Calif., who has gone plus-8 in 23 games since being called up in late February, said he was wearing skates that were just a few days old and that's why they held up to the potential cutting of the skate blade. He said he thought he was "lucky" not to have been cut or have his ankle broken. Nonetheless, he was among those who followed the "it is what it is" line. "I'm not going to say it's a real dirty play or cheap shot, but you don't see it very often and skates are pretty sharp and it's fortunate that I didn't get a cut or anything like that," he said. "So I really didn't feel much pain or anything like that. Like I said, just more shocking." Blum said he knew "right away what (Ryan) did" and so he gave Ryan a slash after the play. He said Ryan said to him, "any time kid." "I asked him, in a way, what he was thinking and stuff like that," Blum said. It is "something that happens in the heat of battle." 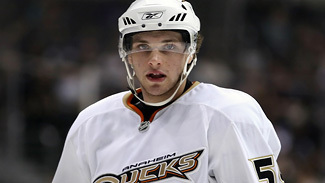 One of the few Nashville players who voiced a strong opinion was defenseman Shane O'Brien, who was drafted by the Ducks in 2003, came up with them and played 62 games with them in 2006-07, giving him several seasons to play alongside Ryan in their system. "I haven't seen it just yet but from what the boys told me on the plane and people showing me what he did, there's no room in the game for that," O'Brien said. "If you want to take a hard, clean hit at someone, that's what playoff hockey is all about, but to go out and stomp on someone's foot twice or however many times you did it, there's no part for that in the game…. "He's a pretty honest guy, but sometimes things happen in playoffs and you get pretty fired up -- and I know from experience sometimes you don't think maybe sometimes like you should and things happen -- but there's still no need for that, to try to step on someone's foot with your skate."